For the most part, I have never been one to experiment with something new when there is a tried and true method for doing things. When something works and works well, why mess with it? One simple reason: to make it better. Such is the case with many of my DIY home remedies and skin care products. A case in point is the all-purpose “miracle” healing salve I concocted years ago. At the time, there were many existing formulas floating around using lavender, tea tree, and lemon essential oil, but mine was different in that it used the unique blend of rosemary, lavender, and peppermint oils. This became my tried and true healing salve, used for anything and everything skin related. Fast forward to today and you will find my formula for “Miracle Healing Salve” all over the internet, including on YouTube and in Etsy shops. Many provide attribution to both myself and the Backdoor Survival website where it was first posted. It is thrilling to me to see that this formula has reached the mainstream and has helped so many people resolve common skin care and first aid woes. That being said, a few months ago I felt it was time to kick things up a notch by increasing the dilution of oils in the original salve recipe from just under 2% to 5%, thus making a stronger product. My goal was to be able to use less salve yet achieve the same beneficial results. I couldn’t be more pleased with the outcome and share with you both the recipe and some common uses for this newly updated formulation. The ingredients below will make about 8 ounces of salve. This amount is easily doubled or even tripled. While waiting for the oils and beeswax to liquefy, drop the requisite number of oils into the bottom of each jar. Add an equal amount of each oil in accordance with the following table. So, for example, I used 4-ounce mason jars which meant I used 40 drops of each oil in each jar. When the oils are completely melted, remove from heat. I like to give them one last stir with my knife before moving on to the next step. Carefully pour the warm oil into each jar, leaving some headroom at the top. When all of the jars have been filled, take a stick (I use coffee stirs that I pick up at Starbucks) or a toothpick and gently stir the liquefied salve. Set aside to firm up. Depending on the temperature of your home, this could take up to 12 hours. Notes: For those of you that grate your own beeswax, I weighed the beeswax pellets (also called pastilles). 2.5 tablespoons weighed in at 0.8 ounces. Also, as a reference, a 5 ml bottle of essential oil holds approximately 85 drops whereas a 15 ml bottle holds 250 drops. If I put some thought into it, I could come up with 101 uses for this awesome healing salve. Let us leave that for another day. Instead, I will give you my top ten favorite uses. Something I have learned over the years is that this awesome skin salve makes a superb carrier oil for other essential oils. The three oils, rosemary, lavender, and peppermint, blend well with other oils and seem to make everything work better. Recently I had an infected earlobe that was red, angry, and sore. Did I mention how much it hurt? I added a couple of drops of oregano oil to a dime-sized dab of this salve and rubbed it into my earlobe to fight the inflammation and what appeared to be an infection. The next morning my earlobe was mostly healed. To me, it was a miracle! Sometimes I add a few drops of Frankincense to my jar of skin salve and use it as a face serum. On other occasions, I have added melaleuca (also known as tea tree) and clove oils to create a potent first aid ointment. The possibilities are endless. When you see one of those lists of ways to use an essential oil on Pinterest but no instructions, consider adding a few drops of the suggested oil to this awesome healing skin salve and rubbing it over the affected area. The combination will give you a one, two, three, four punch that will likely resolve your skin woes. At this point, you might be wondering how I came up with the magical formula of rosemary, lavender, and peppermint. It started back in the early 90’s when my husband was suffering from tendonitis. I found the formula in Valerie Warwood’s book, The Complete Book of Essential Oils and Aromatherapy. Much to our amazement, we found that this synergy of oils resolved his pain. Later, when he had a knee replacement, I mixed these same oils with a bit of sweet almond oil and rubbed them over the scar to promote healing. To this day, the scar is barely visible. Over the years, I have played with many combinations of oils for this or that but always came back to this formulation as my go-to solution anything and everything skin related. For that, I thank you, Valerie. The ingredients used in this healing skin salve are readily available locally in stores as well as online. Because of where I live, I find it more convenient to shop online. In the long run, shopping online saves me money because I can research prices and read reviews, but honestly? It is a matter of personal choice. Virgin Coconut Oil: The coconut oil I used comes from Tropical Traditions, where I purchase this fantastic product in 5-gallon tubs. I kid you not. For smaller quantities, I recommend either the Nutiva brand or the Naterre brand from Spark Naturals that is sold on Amazon with free shipping. Extra Virgin Olive Oil: I used to use “pure” olive oil to save money but have since learned that there is nothing pure about it. Even Costco has rebranded their pure oil to indicate it is highly refined. Go with EVOO. I get Organic Extra Virgin Olive Oil at Costco because I know it is the real thing and chock-full of healing qualities with its anti-inflammatory and antimicrobial properties. Beeswax: I get my beeswax from Amazon and have never been disappointed. I recommend the yellow beeswax pellets since they have not been treated or bleached to turn them white. Ointment Jars: Over the years, I have used both plastic and glass ointment jars. These days, I prefer 4-ounce mason jars coupled with these plastic storage caps that are super handy to have on hand. When I need a smaller amount of salve, or when I want to mix in an additional oil, I will transfer some salve to one a smaller 1/2 ounce or 1-ounce jar that I purchase in bulk for very little money from Amazon. For someone just getting started, I recommend these inexpensive 2-ounce jars that run about $10 per dozen on Amazon. One of the joys of being retired is that I have more time to experiment with new things. But sometimes new is not better. That brings me back to the statement at the beginning of this article where I said I tend to stick with the tried and true. Tried and true is good but always leave room for refinement and improvement. That is the strategic living way of doing things. Before closing, I ask you to do me a favor and give this awesome healing salve a try. There is a reason I call it “Auntie Gaye’s Awesome Healing Salve”. Discover the difference it makes when you stop putting chemicals and petroleum-based products on your skin. Using this salve, you will find that skin heals quickly and it will become super moisturized and pleasing to touch. Dryness and itchiness become a thing of the past. Not only that, you will save a ton of money as you finally are able to toss out all of the over-the-counter skin remedies that never really worked in the first place! Thanks! You know we as a family have been using this salve for years. Will be making new batch soon and will try updated versions! I hope you like it as much as I do. Because it is more potent, I do not need to apply the salve as often when using it for itching (like I said, those darn no-seem-um’s) and pain relief. Now that I am at a certain age, those aches and pains are starting to appear. My hands, especially. At our family reunion in Aug of 2016, my sister was having pain in her leg. I used some Miracle salve (never go anywhere with out it) on it and as I did, others saw the salve and wanted to know all about it as my sister noted quick improvement. Yes Gaye. I gave you full credit and told them how to get to your web site. For the reunion for Aug of 2017 I was told to bring the EO’s and they would bring the jars and the other oils and we were going to have a class on making Miracle salve. All went well, all went home with jars of salve. Now you are saying I will have to have another class next year? I’m sure all will be happy to do it again. Thank you Gaye for all your do. Wow! You gave a class on the Miracle Salve? Ha ha ha – now you can brand it with Auntie Gaye’s Awesome Healing Salve. Kind of fits, don’t you think? I think I can buy the labels. I am kinda sorta thinking about a meet-up at a campground on the Rim next summer. Might be fun to meet people and simply hang out! Perhaps you can join us – even for just an afternoon. That would be fun. Keep me posted. Headed up to the Aspen Campground at Woods Canyon Lake on Sunday if you happen to have some time on your hands. Thanks so much for the updated recipe. Your timing is perfect, I was just about to mix up a new batch. I will definitely be giving the new recipe a try. I’m sorry if I missed it elsewhere, but approximately how many drops are in a 15 ml bottle of oil? A typical 15 ml bottle holds 250 drops whereas a 5 ml bottle about 85 drops. I will go back and add this info to the post when I have a chance. That info is immensely helpful, thanks. Hi, Gaye, are you able to weigh the 2 1/2 Tablespoons Beeswax Pellets? I only have it in blocks. Many thanks! 2 1/2 tablespoons weighed 0.8 ounces. Your question, though, gave me an idea. I need to order a block of beeswax and grate my own to use in the next batch of salve. I love the Strategic Living Blog and recipes. Looking forward to reading about your beauty and hair care regimen. You are so pretty. I will be sharing my DIY face serum next week. After a lifetime of skin woes, that was a game changer for me. If I get gutsy, I will post a picture of what I look like without makeup. Will this Salve work on shingles? I wish I could answer but I have no way of knowing for sure. It is quite soothing and provides both pain and itch relief if that helps. I have also printed out your article on using Birch EO for arthritis and muscle pain, and you said your husband really liked that. Have you tried adding any Birch to this recipe? I just ordered a bottle from Spark Naturals and thought I might try incorporating some of it in this recipe. If so, do you think I should reduce the number of drops of one of the other oils and replace it with the Birch? What are you thoughts? Thanks!! Coincidentally, about an hour ago my husband and I were chatting about both the birch blend for arthritis, muscle and joint pain, and my blood pressure salve. Both blends are used daily in my household and have replaced pharmaceuticals in my medicine cabinet (actually a drawer). 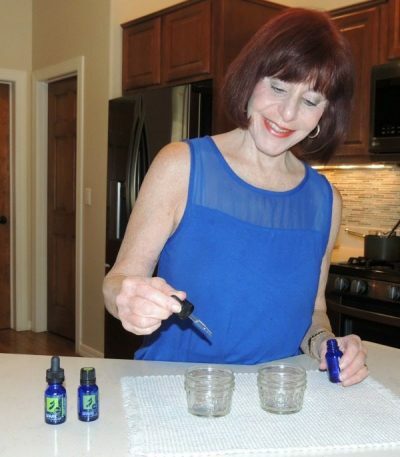 I have never tried adding birch EO to my miracle healing salve so I can’t tell you for sure how it will work since I believe it is the synergy of birch, geranium, and lemongrass that work its magic. No harm in trying, though. As far as changing the number of drops, I would not do that. The birch formula is a strong, 15% dilution so if it were me, I would start by adding 15 drops to the miracle salve and see how it goes. By the way, for many, including myself, the miracle salve alone is enough to bring relief. For my husband, and others, something more potent is needed. I hope to repost both the arthritis and blood pressure formulas here on Strategic Living very soon. Be sure to check back in and let me know how it all works out for you.